In the lead-up to the release of Disney’s latest animation, I couldn’t have been less excited about Zootopia. The gimmick just didn’t seem interesting. A bunch of anthropomorphic animals? Living in a city? Um, yeah…okay. Pretty sure I’d seen that before. But then the trailer came out, that single extended scene, and I began to see that the film had potential. But here’s the thing: that scene (at the DMV) isn’t actually representative of Zootopia. Practically a short film in itself, it’s ostensibly played for laughs and it stands out as being one of the few hilarious moments in an otherwise non-comedic feature. Don’t get me wrong; Zootopia is great, it just doesn’t have as many laughs per minute as Disney’s regular output. 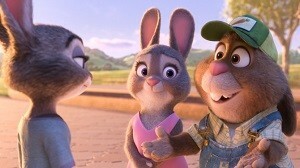 The plot concerns young rabbit Judy Hopps, who dreams of leaving her small town of Bunnyburrow and becoming a policewoman in the big city known as Zootopia. 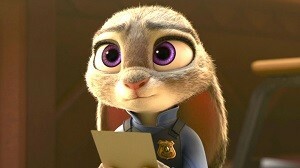 Despite the fact that there’s never been a bunny to take up the badge, Hopps is determined that she’ll succeed. And succeed she does. However, once she arrives, she discovers that prejudice is alive and well in the supposedly tolerant and multicultural metropolis, and all the assumptions about the various species are still bubbling under the surface, even if Zootopia’s exterior suggests a populace living in harmony. Prejudice – in all its forms – is the concept under the microscope here. And the screenplay to Zootopia is very, very good at examining said prejudice from every angle. It isn’t just a case of outright intolerance…the film shows just how hard it is to break free of the assumptions you have absorbed, whether through your parents or osmosis generally, and how easy it is to slip into generalisations about people. Or, in this case, about predators, about species. I may be describing it in a way that suggests the film is preachy or simplistic, but it’s anything but. Disney have steadily been one of the most progressive animation houses in the business (keeping in mind that they have made certain horrendous missteps in the past; hello, Dumbo or South of the South) and this further solidifies their reputation. When a movie ostensibly aimed at kids makes adults think about the way they perceive the people around them, you know that it’s doing more than simply teaching the young ‘uns How To Be Good. Ginnifer Goodwin and Jason Bateman make a great team in a film that basically sticks to the buddy cop formula, even if one of them isn’t a cop. Idris Elba and J.K. Simmons provide fantastic supporting voice work also, and it’s good to see that none of the voices distract you from the story, even if you recognise the owners. In fact, the way the script treats its supporting characters is particularly worthy of mention. Zootopia is a mystery, and like any good noir, all the characters here are important. The puzzle pieces all fit together and support the overall narrative. It won’t bring the house down like some of their funnier output, but Zootopia is a fantastic mystery/adventure with some juicy themes you can really sink your teeth into. Recommended. This entry was posted in Film Reviews and tagged Action/Adventure, Animation, Childrens, Comedy, Drama, Mystery by Stuart Wilson. Bookmark the permalink. Writer: Byron Howard, Jared Bush, Rich Moore, Josie Trinidad, Jim Reardon , et. al.